Ambassador 2013 - The JL Foundation, Inc.
Billy is a high-spirited, athletic, caring 2nd Grader who turns 8 in February 2013. He was diagnosed with Type 1 Diabetes on his first day of school in 2012. He loves playing Football (Jersey # 98), Basketball, Baseball, Lacrosse, as well as music and going to the beach with his sister (Grace). Billy tackled the disease “head-on”, immediately monitoring his glucose levels and giving himself his own insulin shots the first week home from the hospital. He enjoys educating his friends and family about the disease, and is proud to be Co-Ambassador for the TJ-JL Foundation with his friend and Maplewood Football Teammate, Ryan O’Keefe. Ryan is a quiet and thoughtful 8-year old boy. He loves playing with his little brother, Owen (6) and their new service dog, Hannah. He also loves reading, fishing, spending time with cousins, and all sports – but mostly football. 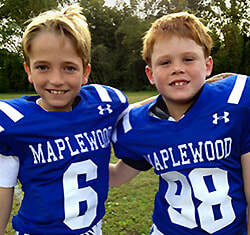 Ryan is the QB for his Maplewood team (#6, after Jay Cutler, who also has Type 1 diabetes). Ryan was diagnosed in January of 2012, following all of the typical symptoms. After a difficult beginning, Ryan is now stronger than ever, and is a hero to his family and friends. Ryan is thrilled to be the Co-Ambassador for the TJ-JL Foundation, along with teammate and schoolmate, Billy Carlsen.